This trek was my first trek to the high mountains of Asia and the beginning of many trekking adventures to follow. I found a website with spectacular photos from this trek. The website was created by a French gentleman who travelled to the Karakoram in the year 2000. I communicated with him and he provided me with the contact to Ghulam and his agency Mountains Travel Pakistan (MTP). I took this trip seriously and started training in December of 2000. I found five other persons to join me. It was the largest group ever assembled by me! The story below is based on the journal by Susan, one of the participants of this magnificent trek. Finally the day of departure came. Our Air Canada flight from Calgary was delayed by 8 hours. This made us miss the flight from London to Abu Dhabi. Thankfully we were rerouted on the exotic Royal Air Brunei. We landed in Abu Dhabi on Royal Air Brunei a few hours later. The bags also arrived with us, which was a small miracle. Prior to embarking on our trek, we needed the permits and the briefing at the Ministry of Tourism in Islamabad. In Pakistan, the Ministry of Tourism is the agency responsible for issuing trekking and climbing permits. To my surprise, the permit appointed me the leader, which Susan took quite literarily. The office at the Ministry of Tourism was a throwback to the British era. The office was located in a small building and had mountains of folders and papers everywhere. It was also a special place of sorts as all climbers, some very famous, had to show up in person for the briefing. The obligatory visit to the Ministry was a Pakistani tradition among the climbers and trekkers. On the walls of the small and crowded waiting area, there were some old posters from 1980s with famous climbers and pictures of mountains we would soon visit. The official issuing the permit was quite inquisitive about the Canadian “Eskimos” and really wanted to know if we have ever seen them and what they were like. Those were the only questions he had asked us. After a friendly chat and banter, the permits were issued and we were on our way. After the meeting at the Ministry, we went without the guide to a lovely viewpoint above Islamabad. It was hot and humid. Then we went to Faisal Mosque. The dark sky, due to approaching thunderstorm, contrasted beautifully with the white marble of the mosque. We could not go inside but walked around the massive courtyard. It is probably the most modern and attractive building in Islamabad. Islamabad is the old city while Rawalpindi is the new section. Rawalpindi is where all the foreign embassies are located. It has wide and tree-lined streets and is surrounded by green hills. It is actually a very nice city. 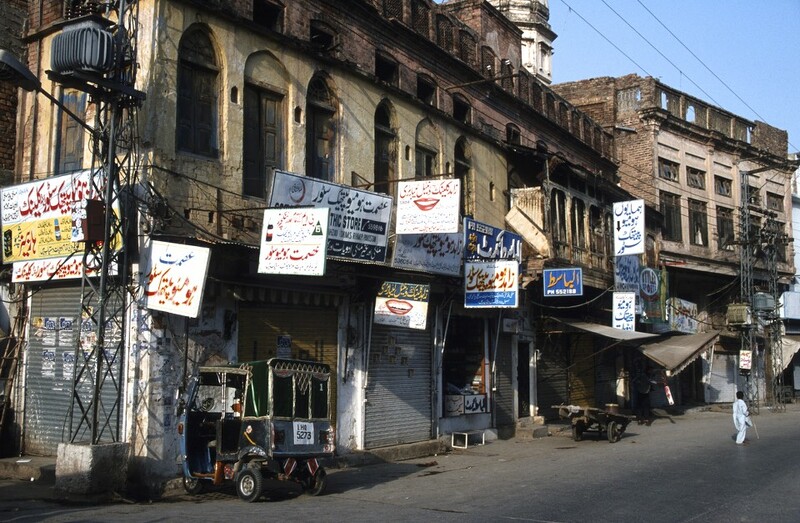 Rawalpindi on the other hand, is old and chaotic. It does have a different charm and, all in all, is very exotic. Everyone was extremely nice and friendly. Pakistan made a good first impression on us. We had tea at the MTP’s office located in a residential high rise and then went to the local bazaar. The bazaar is a maze of very narrow and claustrophobic alleys. It is dividend into areas of specialty so one does not have to wander for hours looking for an item of interest. Again, everyone was all smiles and very friendly. We saw some dead rats size of a house cat! We did not see any other foreigners and were quite an attraction for the locals. So may sights, sounds and smells. It was all absolutely fantastic. We were up by 5.40am for our drive to Skardu, the capital of Baltistan. Baltistan is the province in northern Pakistan where most of the high mountains are located and where our trek was. It is also an area of dispute between India and Pakistan and a reason for the military standoff. We had two days of spectacular driving along the KKH ahead of us. The intent was to fly but we were unanimous that we wanted to drive. We passed many crowded villages with many people milling around. At first, we were driving through lowlands and it was hot and humid. As we drove north, the scenery got more and more spectacular. As we continued up the highway, the Indus River gorge became deeper and deeper and the surrounding mountains became quite steep and dry. The highway is very spectacular and the fact that it was built left us in awe. The KKH was built by the Chinese in the 1960 and 1970. Close to a thousand people were killed in the process. The drops to the Indus River were immense. Everything is bigger here and we had no concept of scale. In all villages there were no women to be seen. Men were running the shops and the women were probably in the fields and homes. As we approached Chilas (the half way point of the drive), we could sense that we were surrounded by high mountains. The scenery became very raw and unforgiving. Right before Chilas, we stopped at a military check post in a big brown tent pitched next to the road. Our passports were examined upside down and we had to register our particulars in an enormous book where we put our imaginary names. We stopped in Chilas for the night. The concrete hotel was new but had an abandoned feel to it as we were the only guests. The next day, we got up early again and continued to Skardu along even more spectacular gorge. Our first view of Nanga Parbat provided a taste of what was coming. We could see the entire mountain looming above the brown hills below. The terrain is so massive that one looses the sense of scale. The fact that Nanga Parbat was entirely covered by snow and ice, indicated that it was a huge mountain as the surrounding lowlands were very hot and dry. We passed the meeting point of three great ranges: the Himalaya, Karakorum and the Hindukush. We then turned east while the KKH continues north towards Gilgit and then China. 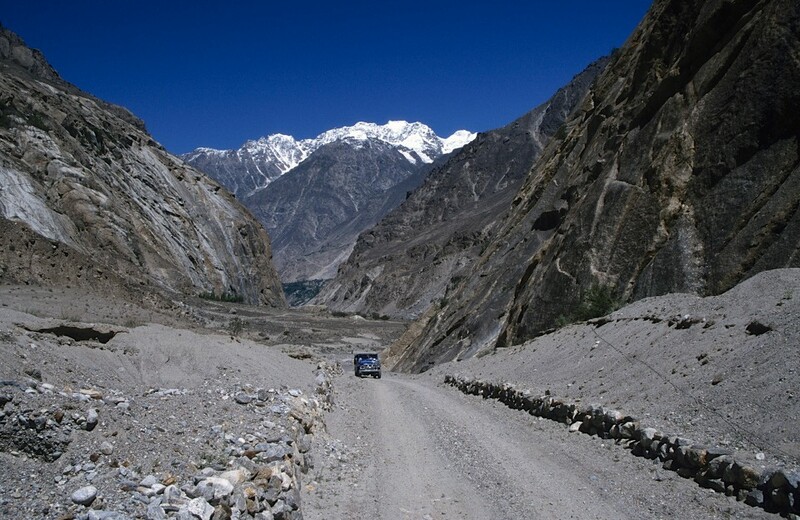 The road between Chilas and Skardu squeezes through a narrow gorge of the Indus River. 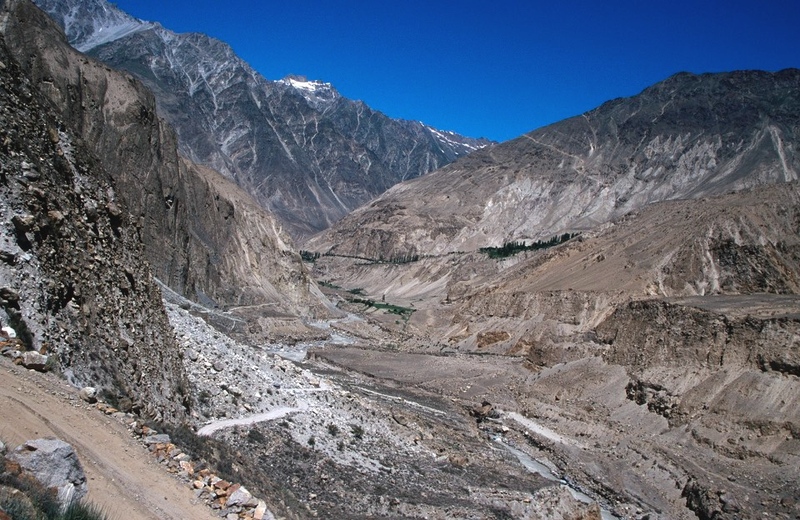 The road is blasted from steep granite walls and follows the gorge all the way to the oasis of Skardu. Sometimes we could see the peculiar cable pullies stretched across the gorge and used by the locals to ferry cargo and people across. The confluence of the Himalayas, Karakoram and Hindukush. This is also the turnoff to Skardu from the main KKH. We arrived in Skardu around 3 pm after the spectacular drive along the Indus River gorge. The rushing waters of the Indus were very turbulent. The river has a lot of power in it as it pushes its way through the Karakoram. Ultimately, the massive glaciers of the entire range drain into this river. The region is very mysterious and shrouded in history. It is located at the confluence of China, India and Pakistan. It has some of the most dramatic mountain scenery on Earth, some of the longest glaciers and inaccessible valleys. It was explored by Eric Shipton and Bill Tillman and described in the book “Blank on the Map”. This book was one of the greatest exploration stories ever. In Skardu we stayed at the Pioneer Hotel. After arriving, we had tea and started to organize our gear for the trek. We visited the local bazaar. 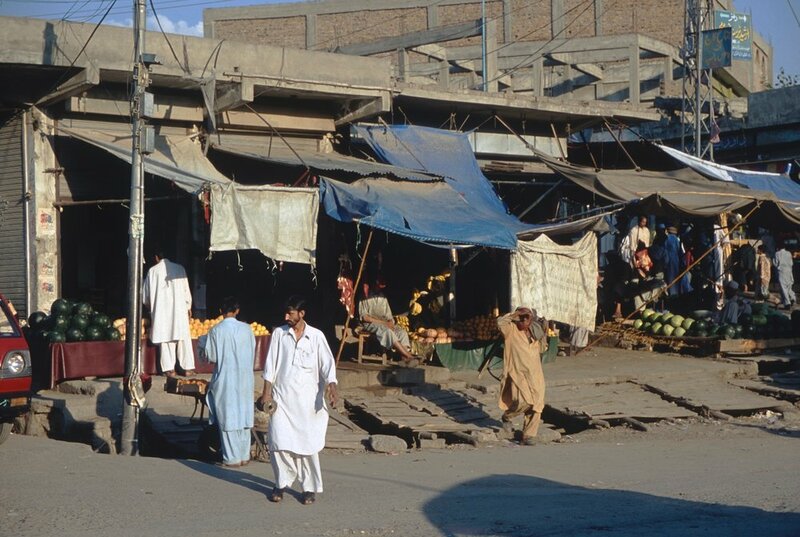 Joe purchased Shawal Kamiz (local outfit) and became a full-fledged Pakistani. We visited the Skardu Fort located at 7,500 feet of elevation. The fort was built in 1600s. It was really just a shell of a building with very little inside. 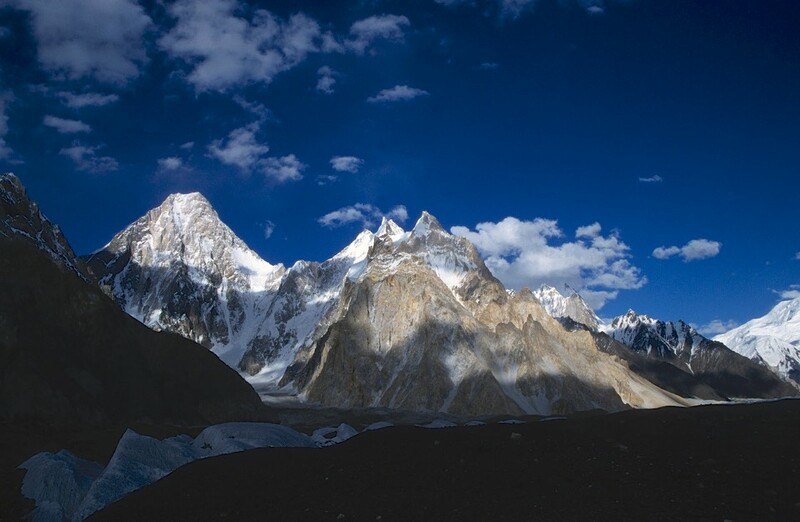 It was however a backdrop to one of the scenes of the movie K2 mainly due to its dramatic location on top of a rocky outcrop overlooking the valley. We could not photograph inside of it. From the Fort we had incredible views of Skardu and the Indus River valley below. The area around Skardu is really an oasis in this very dry landscape. 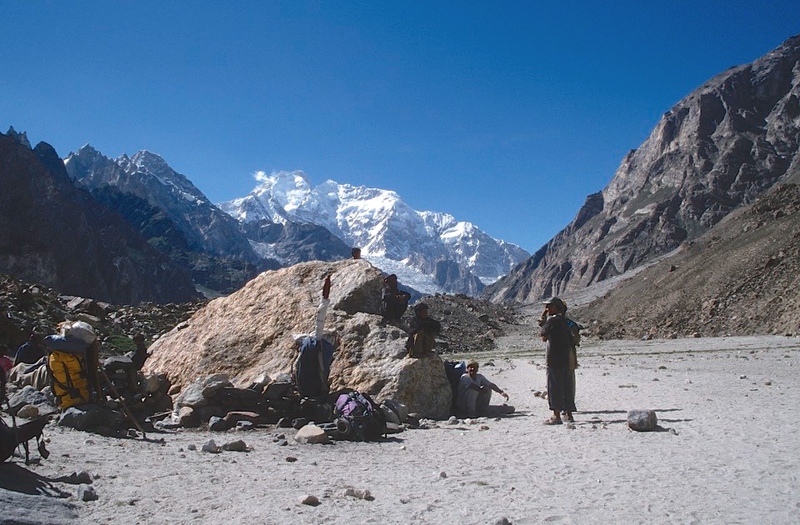 The town is surrounded by sharp and dry peaks but the real giants of the Karakorum are hidden from the view. We could see the on going cricket match down below and the empty local polo field. Susan was looking for a place to make a long distance phone call and our driver Mohamed took us to 3 or 4 different places. We had our dinner at the hotel with the tables set up outside. We watched chapattis being made in the outdoor oven. We had to be up at 4.30 am to start our drive to Askole, the start of our trek. We needed to start early to beat the rising water in the stream that we needed to cross by jeeps. Not in a very distant past, the distance from Skardu to Askole required a week of walking along a dry and dangerous trail snaking above the Braldu River (the Braldu River originates at the Baltoro Glacier). The trail was prone to rock fall and land slides. Today we can drive it in a few hours. Now we know why the jeeps were required for this section of the road. The road is barely a jeep width. We travelled in a convoy picking up porters along the way. None of us has ever been on a road like this one. One of the jeeps had trouble with crossing a stream. While the jeep got stuck in the rushing and rising water, the chickens we purchased for the trek attempted to escape, porters had to jump into the water from the jeep while the other drives were standing around offering great advice. Finally we made it out through the stream. We walked the last stretch of the road to the village of Askole where we camped for the night. We shared our camp with 3 American women and 2 Japanese men. There were many, many porters milling around looking for work. There is a specific system for hiring porters. They have special ID cards. The trek is dividend into stages and there is a set rate of pay for each stage. The porters cannot carry more than 20kg per load and need to be issued sunglasses and shoes for the snow and ice. The village consists of mud houses that provide shade and cool during the extremely hot summer and good insulation during bitter winters. The village probably has not changed in 400 years. They have a school of sorts and a dispensary. I caused quite a splash with my size and felt like a circus act when walking around town. The Balti people (this area is populated by the Balti tribe) are quite small and look more like their Tibetan neighbors than the Pakistanis from the southern part of the country. We felt uncomfortable sitting in the campsite being served while the villages watched. The villagers just stood there in silence observing our every move. I guess, the passing Westerners provide them with great entertainment. Instead of sitting around, Mike and I took a jeep ride to check out the local bridge above the Braldu River. We walked across rickety bridge to the other side above the turbulent and loud river. The space between bridge planks was at least a foot and the railing was barely up to my knee. The bridge swayed and rocked and we could only cross it one person at the time. It was quite unnerving to go across it above the rushing torment of the river. We took great care. After, we saw a couple of small kids just hop across the bridge with no effort or fear. We had a good supper of veggie curry, chicken legs, mac and cheese and a sliced mango. It was quite a luxury. Today we had our first real day of trekking. We got up at 6am to a great breakfast. We met a fellow from Askole (Ali) who travelled to BC in Canada to film the movie K2. We were all invited to his house for a meal should we be back. We had fantastic weather and it was hot! Joe got too much heat in the morning and felt sick at lunch. Once he had a lot of water and some food, he regained his energy after lunch. Ibrahim carried Joe’s pack while Mike carried his boots. Mike said it almost killed him! The trek began on a sandy flat river valley. We passed the confluence of the Braldu River valley and the Biafo glacier (another massive glacier draining the center of the Karakoram Range). See the trek from Biafo glacier from 2005. As the day progressed, it got hotter and hotter. We got our first view of the famous Paju Towers. The surrounding mountains got steeper and higher. We hiked a stage and a half to Jola. On the way to dusty Jola, we crossed a very rustic bridge one person at a time. The camp had wild irises and lavender that we could smell from far away. It was a tiring day mainly because of the heat. After dinner in Jola, we had dancing and singing by the porters. They were using the blue expedition drums as instruments. We had breakfast at 5 am with the idea of starting early to beat the heat of the day. At midday, the heat reflects from the rocks making the air feel like a dry sauna. Today we walked to Paju. We left at 6.20 am to beat the heat and rising rivers along the way. Although we left early, the day was very hot. Mike got affected by heat and got a mild heat stroke. As we approached Paju we had our first view of the great Karakoram mountains: Trango and Cathedral Towers. They looked like giant brown teeth looming above the Baltoro Glacier below. We had lunch on a rocky spot by the river and the temperature was like an oven with no shade in sight and nowhere to hide. We sat by the stream for quite a while just to cool off. We passed by many wild rose bushes that were in the height of bloom. It is miraculous how they grow so profusely in such a dry place. We crossed the rivers without incident with some help from porters. The Paju camp is located on many terraces and has many trees. It is a custom to stay here for two nights. The rest day allows the porters to prepare food for days ahead. We had a good dinner and more dancing in the evening. Chris was dancing with the American girls and lasted into the night. We used the rest day for a 4-hour exploratory walk to the ridge above the camp for a great view of the mountains. We came to a nice waterfall, which we named after Joe: Babusar Falls. We came back to camp in time for great lunch. I asked to see the killing of the goat that was to provide meat for our porters. Watching the goad being killed was very unpleasant, as our urban sensibilities are not accustomed to such things. This is the campsite that the goat is killed at and the porters have last meat meal before the glacier. We had goat liver curry but did not eat too much as we had stuffed ourselves at lunch. After lunch we moved from one shady spot to another to escape the heat. Today we started walking on the Baltoro Glacier among some of the greatest scenery imaginable. We ascended the rock-covered snout of the giant Baltoro Glacier. At the snout, the rushing water gave birth to the Braldu River that we have been following for the past few days. The Baltoro is a giant sea of ice covered by thick layer of rock with streams of rushing water on top. The walk was 6 hours and due to the heat it felt long. Chris did not feel well and Ibrahim carried his pack again. Chris was quite adamant to carry his oversized and heavy pack. He wanted to be tough but the heat beat him. We had good rest under a cool rock with Paju Peak in front of us. Our camp is at the edge of the glacier surrounded by ice and waterfalls although still very hot. The camp was at 13,000 feet of elevation. We are now surrounded by famous peaks that are very impressive. Giant spires and steep rocks with glaciers and ice formations. 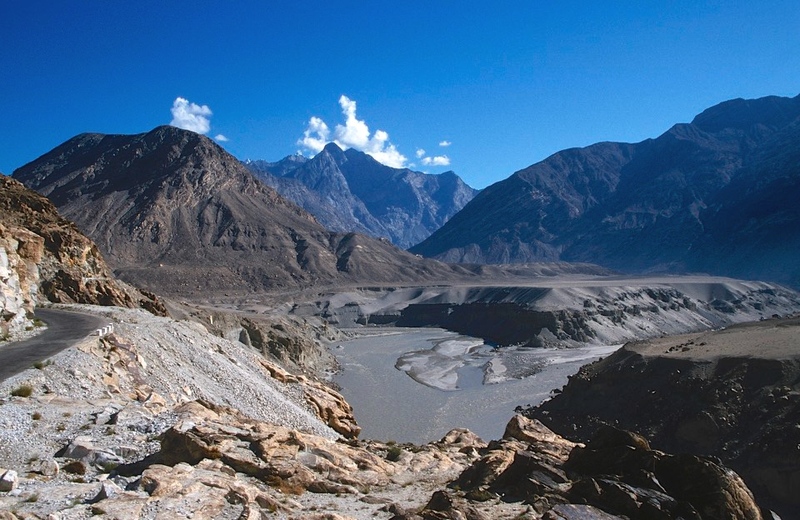 It is a very unique landscape not only among other high mountains but also in the Karakoram Range itself. Mike passed out in the shade beat by the hot sun. We had an easy walk today with a late start. We walked on the glacier among ice ridges and spectacular scenery. At camp we hiked above 14,000ft to take photos of the great panorama across the Baltoro Glacier. For dinner we had a cake with Canada Day written on it. Overnight the weather changed and we had some rain. Lots of hiking today on the surreal glacier with huge chasms of rushing water, spires of ice and immense boulders balanced on ice pedestals. Spectacular mountains now surrounded us. We had a good view of Masherbrum that was initially hidden behind a thick cloud. Far in the distance, the Gasherbrum 4 (a famous almost an 8,000 mountain) towered over Concordia (the confluence of three glaciers and our destination). I shot 2 rolls of film today. We walked as a group, which was nice, taking our time and enjoying the scenery. The weather turned a bit around lunch and we could watch the clouds roll up the valley as the wind picked up just before camp. We passed what must be the most desolate army post south of the Gulag. The post consisted of some scruffy tents on the glacier. I was sleeping in my tent and was awoken around 2am by frantic discussion between Mike and Joe. Mike was desperately looking for the roll of the toilet paper, which he misplaced again (as he did during all previous nights). Tonight though was different. It was the night of reckoning and the misplaced roll would have serious consequences for him. As the desperation climaxed and the apricot soup worked its way back to the world, Mike exclaimed, with anger and resignation in his voice, that it was really all my fault. His soiled pants on the frozen glacier were a direct result of me talking him into the trip in the first place. I did not want to add fuel to the fire and contained my laughter inside my sleeping bag. Mike never misplaced the toilet paper again after this incident. I can just imagine having to deal with the consequences of “the incident” in the middle of the night on the frozen glacier. I felt very sorry for him and for Joe who had to deal with the fallout. Susan sat up and had coffee with Ibrahim and talked about comparative lifestyles. Ibrahim is a very interesting and caring man, he is great with Joe and seems much older than 27. Susan concluded that one must grow up much faster in Pakistan. We had a late start to day. It was our first real rainy day. Mike woke up in a foul mood and was not very talkative – understandably so. We walked for 4.5 hours on the glacier crossing crevasses and watching the ever-changing scenery. We walked slow, had many stops and rested as were now walking as a group and were much higher. When we got to the camp, we saw the top of K2 about half again as high as we were expected to see it. It was incredible. It was the first time for me seeing an 8,000 peak and K2 is the second highest peak on the planet. There were little glimpses throughout the afternoon of all the peaks. It is the throne room of the mountain gods but the gods were playing games. We arrived in Concordia at 15,500 feet at 2.30 and had a relaxing afternoon. Mike was not feeling well and will take a rest day. We were planning to go to K2 BC tomorrow depending on the weather. The area of Concordia is like the front row seat in front of the highest peaks on the planet. 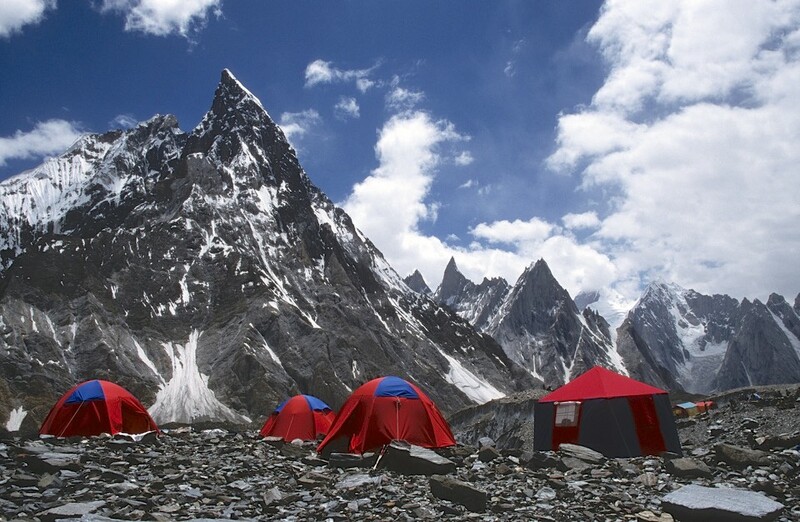 To the left of our camp, 20 km away is K2, the king of mountains. Right next to it is Broad Peak, another 8,000 peak. Next to Broad Peak is Gasherbrum 4, an extremely beautiful mountain. Its steep south face towers over Concordia and is illuminated by the setting sun. The beautiful gold glow of the rock gives it its nickname “The Shining Wall”. During the 1980, these peaks were the arena of many mountaineering dramas in which the Poles played major roles. The 1986 K2 tragedy saw many people killed in one season. One of them was Tadeusz Piotrowski from Szczecin, my hometown. Broad Peak was traversed by Kukuczka/Kurtyka duo and it was one of the greatest climbs ever made. The ascent of the Shining Wall by Kurtyka and Robert Shauer, was one of the finest climbs in alpine climbing history admired to this day. It was very special for me to be here and to see these places with my own eyes. Looking at K2, I felt that it would be a very lonely and desolate place to die. It felt very far away from civilization and the energy surrounding this place was not very positive. It felt raw and lifeless. What a day. We had a very lazy start as we were under the weather. We had a leisurely breakfast. At 9.20 am we told Ibrahim that we wanted to go to the Gilkey Memorial. The Gilkey Memorial is the place where climbers who perished on K2 are buried and where there are plaques for the missing. It is named after an American Climber Art Gilkey who saved his companions on K2 from falling by stopping the fall with his ice axe. We made it to the Broad Peak BC at noon and had tea with an American climbing team while Ibrahim visited with his good friend at the camp. They had already set up 3 camps and were waiting for the weather to clear to go to the top. One member of their party was coming down from Broad Peak and we could spot him in the distance. The weather was overcast and rainy. It was unfortunate because we could not see much of the spectacular scenery surrounding us. We then headed off for Gilkey Memorial, which is located at about 17,000 feet. We arrived there at 2.30 or so. The place felt rather creepy with the low clouds and the wind. The memorial was full of metal plates with names on them, many of which I recognized. Many Polish and many young people in prime of their lives were buried here. The place was a desolate desert of rock and ice. We were at the foot of K2 and Broad Peak was just across the glacier. K2 BC was very cold and foreboding with all the glaciers connecting in one cold place. We had some tea and snacks that magically appeared from the porter’s pack (Shabir) who accompanied us. We left the memorial around 3.15 pm. We stopped at the Swiss Broad Peak BC and received cool reception. We were looking around to use the sat phone and ended up visiting the Bulgarian and Chinese basecamps to no avail. We continued the torrid pace to make it back to Concordia before dark, which we managed to do but just barely. We were all tired and Ron had hard time breathing. Ibrahim was very impressed and claimed that we set a record of walking 20km (there and back) in 8 hours. We walked over glacial rocks, up and down moraines with a 1,250ft elevation gain. It was a long but wonderful day, we made it to K2. We also discovered what an elusive woman K2 is. She would peak her head out of the clouds and the wind and then disappear again. Last day in Concordia. We debated going to the Ali camp today but our tired bodies from yesterday and the gradual change in the weather (for the better) convinced us that we had made the right decision to stay. Ibrahim went crystal hunting and arrived with some fine specimens. I stashed one of them in my bag. We relaxed, did some washing and walked around to take photos of this spectacular place. We also watched a large Spanish/German group arrive with 120 porters and large cameras. We spent much time watching K2 and Broad Peak hide behind the clouds and re appear. We had luxury of time in such an incredible place. It is however, very cold at night and all the layers are coming out. At sunset, I took some fantastic photos of the spectacular Shining Wall. It sure lived up to its name! After dinner we were huddled in the mess tent when Ibrahim called us out to watch the partial eclipse of the moon. The night was spectacularly clear with all the mountains lit up by the moon. What a breathtaking way to say good-bye to Concordia! We concluded that now we would be satisfied by nothing less than a total eclipse. Ali Camp is the best mountain scenery camp we have seen so far. We had fantastic weather, sunny and no wind. During the walk, the view back to K2 and Concordia was very spectacular. We could see the ice highway, which we trekked over two days before. 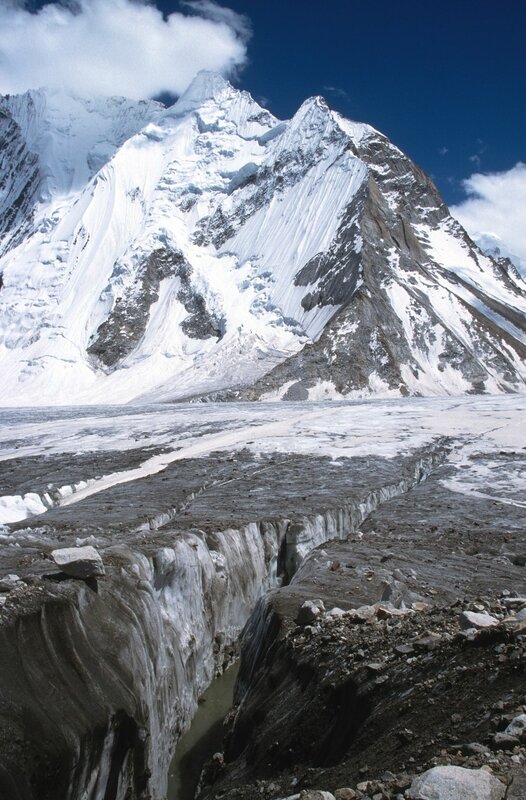 K2 was towering over the surrounding landscape. The mountains here are so massive that the distances look very deceiving. The distance of nearly 20km does not look far at all. We were now on a wide white glacier surrounded by peaks we had seen now from different angles. It was another incredible day. We arrived at Ali High camp at 4 pm and had garlic soup apparently to help with altitude. Joe had extra garlic and Sue had extra ginger. They kept feeding us and we felt like lambs to the slaughter. We all huddled to the mess tent with a lantern and attempted to sleep. Chris slept through most of it and the rest of us did not. It was quite cold as we just sat in our sleeping bags waiting for the time to go. At midnight we drank some green tea and started to get ready for the crossing of the Ghondogoro Pass. We had our gear ready and waited for the porters to get organized. We met the “rescue team” who helped us to cross the pass. The moon was almost full and it was very bright. The walk across the valley glacier floor was eerie as we were led by the rope behind the porters. We were not really roped in so the safety was not the greatest. We broke through some soft snow and were all concerned about hidden crevasses. We then started up the pass and eventually met the fixed ropes. We were wearing harnesses, crampons and helmets while the porters had their rubber boots, 20kg loads and sticks. It was a bit embarrassing. We still had the bright moon with us as we started ascending around 3am. We climbed the ice and snow into the first light at 4.15 am. We crossed bamboo ladders over some deep crevasses. We reached the top at 5.20 am, just in time to enjoy the sunrise, with celebration among the porters. The elevation of the pass was at 5,565m. Joe and Chris played hacky sack on the top. We took many photos and got our first look at the Leila Peak and Masherbrum in the distance. We were all offered garlic tea on the top of the pass. Ron had a rough day and had an asthma attack later. From the pass we could see the upper part of K2, Broad Peak and the two Gasherbrums (another 8,000 peaks). The tops of these mountains were visible above the ridge that surrounded the glacier at the base of the pass, which we crossed during the night. We descended on fixed ropes on the rocky side of the pass and arrived at the camp. The descent was quite steep at the top but the fixed rope made the descent quick and efficient. The camp is located in the meadow filled with flowers and surrounded by high peaks. Cricket was played at the camp, we had some dancing and singing and tipped the rescue team for helping us. The camp is located at 15,700 feet. Today we dropped from 15,700 ft. to 12,000 ft. We went from glaciers and moraines to lush valley filled with roses and trees. Much of the morning was spent on the Ghondogoro Glacier walking (or hopping) on some huge boulders. We then started walking in a valley after passing the confluence of the Ghondogoro Glacier and the spectacular Masherbrum Icefall. We walked passed a large ice cavern with rushing water disappearing into its icy interior. We arrived at the lunch spot and Chris was not doing well. He was carrying a very heavy pack filled with numerous rocks he picked up along the way. As it got very hot, he had a heat stroke and needed to cool off urgently. He threw up and needed to rest. This took some time and we did not start walking again until afternoon. It was interesting seeing Ron quite oblivious to the unfolding drama. After lunch we had two river crossings. The water levels in the rivers were higher this time of the year and especially this time of the day. The snow was melting in the afternoon heat and the water rose rapidly. Within a span of 45 minutes, the clear stream became a rushing torrent of turbulent water with large boulders rolled under the surface. I managed to cross first in the relatively low water. As soon as I arrived on the other side, the mayhem broke out. The water became too dangerous for crossing. The porters were trying to make a path by throwing boulders into the torrent with no success. The water was too deep and still rising. Plan B materialized when Chris’s rope finally came out and was thrown across the stream with help from a water bottle. Eventually we got all porters across but it was quite a struggle to walk in the rushing torrent. Shariz was the cowboy star helping all across. The next crossing we were promised a bridge, but of course there was no bridge and we had to repeat the wet crossing again (with little less drama as we knew what to do). We had a lovely walk down to the camp among bushes and flowers. At the camp we could buy Pepsi, juice and water. They also had showers. After dinner it was quite cold, so no shower. The crew had another singing and dancing session celebrating the end of the trek. Shariz was the stage manager. We have not yet figured out the pecking order among the porters but it seemed important to them where everyone was sitting. We were made to dance with Joe being the crowd’s favorite. They really go out of their way to keep us entertained. We left Seicho camp at about 8 am and reached Hushe at noon. It was a beautiful walk. We left Masherbrum behind us and entered green fields with children and women working. We were also greeted by sad news that one of the porters lost his wife and his sister while crossing a river. He is from Hushe so everyone gave their condolences. It put a damper on our last walk. With that in mind we packed into jeeps to cross yet another river before lunch. Just before Kunde (Iqbal’s village) we left our jeep and the porters unloaded to carry all our stuff to the MTP jeeps across a landslide. Chis and I rode on top for the first ride, which was rather hairy. Then we all did as the views along this road were just amazing. We had lunch in Khande at the K6 Motel. The K6 owner was also one of the locals that went to BC for the filming of the K2 movie. He was a very nice gentleman and had some nice pictures to show us. After lunch we tipped the porters who each came in individually to shake our hands and thank us. It was quite humbling. These guys risked their lives for us on more than one occasion (as the loss this morning attests) with smiles on their faces. It is the Balti way. Next it was back into the jeeps and ride to Ibrahim’s village (also Shariz and Ali) Machilu. We are getting used to the jeep rides and they almost feel ordinary. His village is very beautiful. We were taken to the government guesthouse. It had a magnificent view from where we could see Ibrahim’s house where we had been invited to dinner. Unfortunately due to the water shortage, we had to pass and continue on to Khaplu to the K7 Motel right by the Raj’s palace. The ride through the town to the hotel was brutal as the road was under construction and it was just big rocks. The K7 was not the Ritz but intermittent water was much better than we were used to and, again, the view was magnificent. As we pulled into the hotel, we were told there was a polo match about to be played so we had our tea and headed down: Joe noted that we were bigger attraction than the polo. Sue was the only woman in the crowd but had luckily traded her hat with Shariz for the day in return for a scarf/shawl his girlfriend had given him. Finally, properly attired, the crowd parted before our eyes, police were moved, children scattered, and we were seated on a red couch by the scorekeeper and the Raj himself! We chatted with the Raj, told him where we were from and watched the polo. It was great fun. Drums and music were played at the appropriate times to the thrill of the crowd. The Raj (who also owned the hotel as it turns out) left early when some army VIPs showed up to see the old palace. When the match ended we sort of followed along and Ibrahim and Meharin wrangled our way in to see it also. The palace is 375 years old and has some beautifully ornate woodwork. Unfortunately it is in a great need for some restoration work. Supposedly this is coming. It’s not a large spot, as summer places go, but you can see how it would have been beautiful and offered the Raj a view of his polo ground and the town from the roof. We had dinner back at the hotel and a chat with the Raj. It was another beautiful night full of stars. Ibrahim, Wahadin and Shariz went back to their village for the night and arrived at 7 am. Ibrahim arrived in the morning with apricots from his garden. The drive to Skardu was long, hot and generally uneventful. It is a long drive of 100km. We checked into the good old Pioneer Hotel, had showers, lunch and then off to the bazar. It now seems quite cosmopolitan after where we have been. We even saw some familiar faces of porters wander the streets. We did some shopping and got engaged in discussions with shop owners. We met up with a group of Germans that was just heading out to Concordia with MTP. We all went to the lake Satpoor. One of the Germans was a former mayor of Munich. He gave me the lead to the Mountain Sun Valley agency in Kathmandu for the trek to Mt. Kailash. The spot at the lake was quite lovely: cool and clear water. The lake provides all of the water supply to Skardu. After a long chat with the Germans, we headed down to Skardu. Some of the Germans wanted to take photos while our group wanted to go back to the hotel. Derek and Sue joined the Germans to go and see the ancient Buddha carving and then to Ghulam’s house (and his brothers). We met the children belonging to all three. Shariz popped out of the woodwork to climb trees for apricots and mulberries. He then helped to serve tea of course. They have a great house and an exquisite garden. We finally headed back to the hotel where we had the financial meeting with Ibrahim and signed Joe’s B-day card. We had dinner outside. The BBQ was excellent, with Nan bread instead of chapatti. It was all very nice. We thought that today was the flight day to Islamabad for Sue, Ron and Chris, but by 9.30 it was clear that there would be no plane. 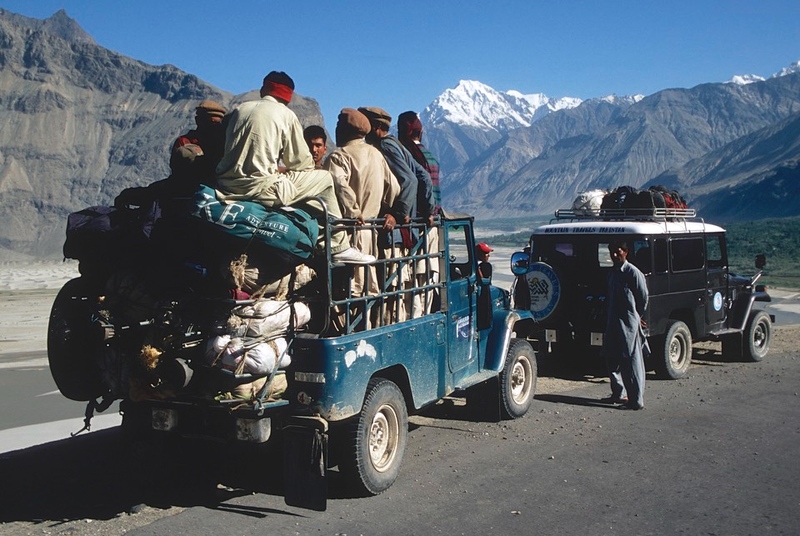 They decided to take the jeep with us to the fork in the KKH from where we would go north to China and they would continue back to Islamabad. Our vehicle run into trouble soon after leaving Skardu. We had a suspension problem. The problem was quickly fixed with wood from nearby trees and some rocks. Soon thereafter we stopped for a tea break. At the break, we said goodbye to Sue, Ron and Chris. They were heading back to Islamabad and we were off to Kashgar in China. Abbottabad. The final home of Osama Bin Laden! One of many colourfully decorated trucks along the Karakoram Highway. Indus River and the Karakoram Highway. The section between Chilas and Skardu. Skardu. 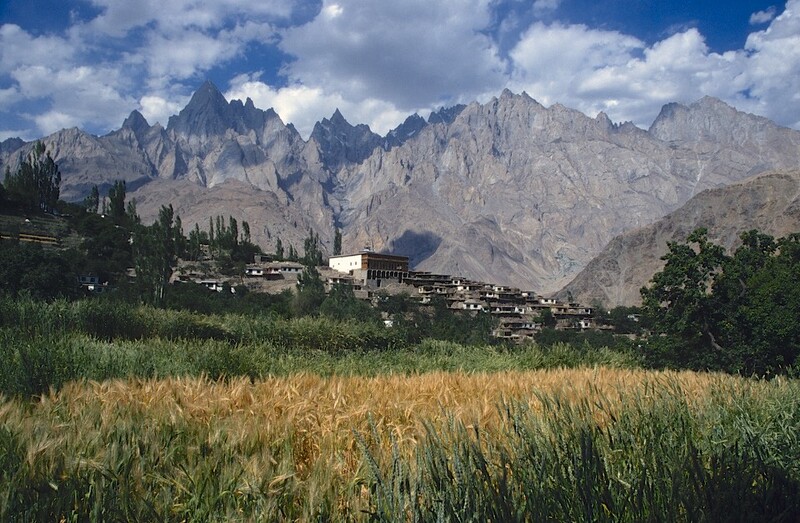 The Skardu fort is located on the right side of the rocky outcrop in the middle of the valley. The road from Skardu to Askole had many washed out sections. Leaving Skardu, packed and ready! The road from Skardu to Askole. Askole - the shaky bridge over the Braldu River. Askole, the chief of the village. Askole, the end of the road for the jeeps. Day 1, hike from Askole to Korophon. We hiked for 12 km on the dusty trail passing the snout of the Biafo Glacier along the way. The bridge over the Braldu River on the trail from Askole to Korophon. This bridge does not exist any more. Trail construction on the trail near Jula camp. Looking towards the Paju Peaks on the trail from Akole to Korophon. Day 2, trail from Korophon to Jula. We had 2 goats for the porters to kill and eat in Paju. Making chapatis in Paju camp in preparation for the Baltoro Glacier. Day 3, Paju Camp, the porters killed and ate the goats before getting on the Baltoro Glacier. Between Korophon and Jula camps. Day 4, on the trail from Paju to Khoburtse. Lobsang Spire is directly ahead. The view of Lobsang Spire and the Mustagh Tower hiding behind. From the camp at Khoburtse. Uli Biaho 6,417m and Paju Peak from Khoburtse camp. Paju Peak and the Paju Icefall. The Great Trango Tower 6,286m (right) and the Nameless Tower 6,230m (left) from the trail between Paju and Khoburtse camps. On Day 5 we walked from Khoburtse to Urdukas. The Nameless Tower 6,230m from the trail on Day 4. From the left to right: Uli Biaho Tower 6,109m, The Great Trango Tower 6,286m, the Nameless Tower 6,230m and Thunmo Cathedral 5,866m from Urdukas on the morning of Day 6. The Thunmo Cathedral 5,866m from Urdukas. The Great Trango Tower and the Nameless Tower from Urdukas. The Baltoro Glacier, Uli Biaho Tower 6,109m on the left, The Great Trango Tower 6,286m, The Nameless Tower 6,230m and Thunmo Cathedral 5,883m from Urdukas. Our camp at Urdukas on Day 5. The name Urdukas means “split rock”. Day 6 - we hiked from Urdukas to Goro II camp. The weather deteriorated and we could tell that clouds and snow were coming. We walked by the Mustagh Tower but it was obscured by clouds so we could not see it. Along the trail from Urdukas to Goro II camp on Day 6. Looking back towards the Great Trango Tower from the trail on the Baltoro Glacier between Urdukas and Goro II camps. 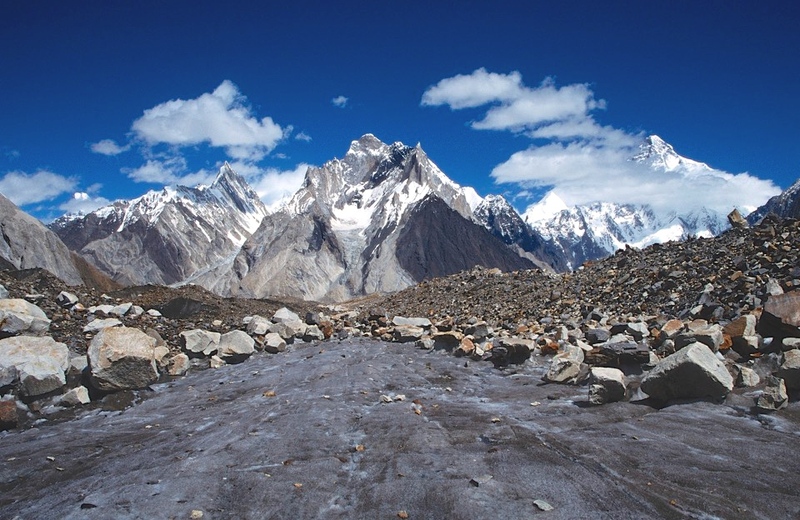 The Biarcheldi Mountain and The Masherbrum 7,821m (on the right) and the confluence of the Biarcheldi Glacier and the Baltoro Glacier. En route to Goro II camp. Gasherbrum IV 7,925m can be seen far away at the end of the glacier. On the Baltoro looking towards Gasherbrum IV 7,925m from Goro II camp. Masherbrum 7,821m (centre) and the Biarcheldi Glacier. Broad Peak 8,047m from Concordia camp. We walked from Goro II camp to Concordia on Day 7. We took 2 rest days in Concordia. I did not really rest during the first day as we walked to the K2 Basecamp and back in one very long day covering the distance of 20km. The confluence of the Biarcheldi Glacier with the Biarcheldi Peak and Masherbrum behind. The Gasherbrum group with Gasherbrum IV on the left 7,925m. on the way from Goro II to Concordia. Gasherbrum IV is called the shining wall as it glows gold in the setting sun. This view is from Concordia camp at 4,650. Our camp at Concordia at 4,650m. From here a fantastic panorama of mountains is visible: K2, Broad Peak and Gasherbrum IV. Also numerous smaller peaks and Mt. Cholgolisa. 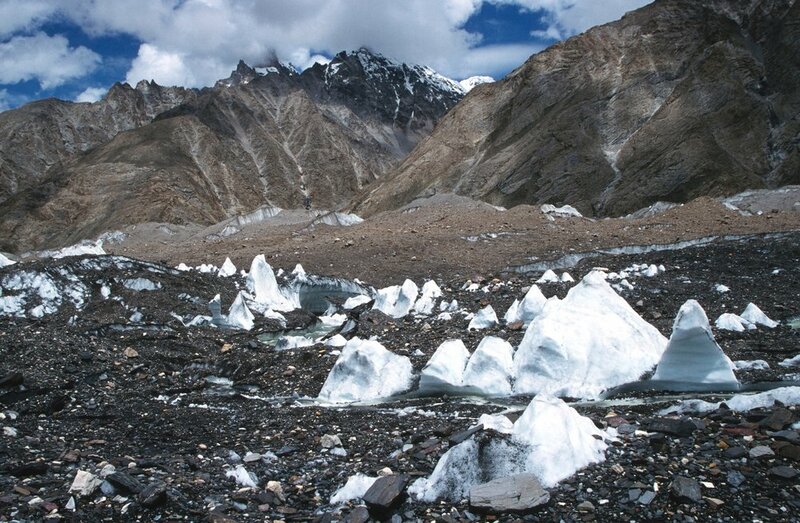 Concordia is where the Godwin-Austen Glacier meets the upper Baltoro Glacier and Vigne Glacier. The pointy peak above our camp is called Mitre Peak 6,025m. The Mitre Peak 6,025 and the Baltoro Glacier. Our camp at Concordia at 4,650m looking south to where we came from. Gasherbrum IV from Concordia at sunset. The beautiful light gives it the name “The Shining Wall”. The Shining Wall aka Gasherbrum IV at sunset. The Gasherbrum IV at sunset. Our camp at Concordia. During our day trip to the K2 basecamp we had cloudy weather and rain. The view of K2 from the BC is very foreshortened. The mountain is just too massive and high. K2 is bert viewed from the distance (like Everest in Nepal). Broad Peak with lenticular clouds from the trail between Goro II and Concordia. K2 and Broad Peak from the Upper Baltoro Glacier. During the first rest day on Day 8, we took a trip from Concordia to the K2 BC. The weather was overcast and gloomy with some rain. We walked by the Broad Peak BC meeting some climbers. The Broad Peak BC is at 5,000 on a barren moraine of the Godwin-Austen Glacier. We then walked to the K2 BC and the Gilkey Memorial. The weather made the experience gloomy and somber. The names of climbers who died in the mountains have been inscribed on steel dinner plates with some more ornate plaques. I recognized many names of famous Polish climbers that perished on K2 and Broad Peak. The total trip from Concordia to K2 and back is 20km. The walking is fairly flat (500m ascent over 10km) on glacier rubble and ice. We were quite tired at the end of the day and arrived back at the camp at dusk. Thankfully we had another rest day scheduled for the following day, Day 9. K2 from Concordia on Day 9 evening. The mountain is 10km away! K2 from Concordia Day 9. Broad Peak at sunset on Day 9. The satellite peaks of Gasherbrum IV. Looking up the Vigne Glacier on Day 10 en route to the Ghondogoro high camp (aka Ali Camp at 5,010m).. The Gasherbrum group from the Upper Baltoro Glacier on Day 10. The Ghondogoro La 5,940m from the Ali Camp at 5,010m. The route follows the shadow in the centre of the photo. On Day 11, after sleepless and cold night at the Ali Camp, we started our ascent at 2 am. We crossed the glacier in roped teams looking out for hidden crevasses. We then started the 930m ascent arriving at the top of the pass at sunrise. We had beautiful weather and good visibility and low wind. We had to cross some funky sections with large seracs looming overhead. We also had to cross a few crevasses along the way up. Once on top, our porters smoked K2 cigarets and drank garlic tea that was supposed to be good for altitude. We took many photos and admired the early morning view. From the top, we could see K2 and the Gasherbrums rising from behind the nearby ridge. Four 8,000m mountains are visible from the pass. The view to the south was much better with Laila Peak rising majestically over the glacier below. 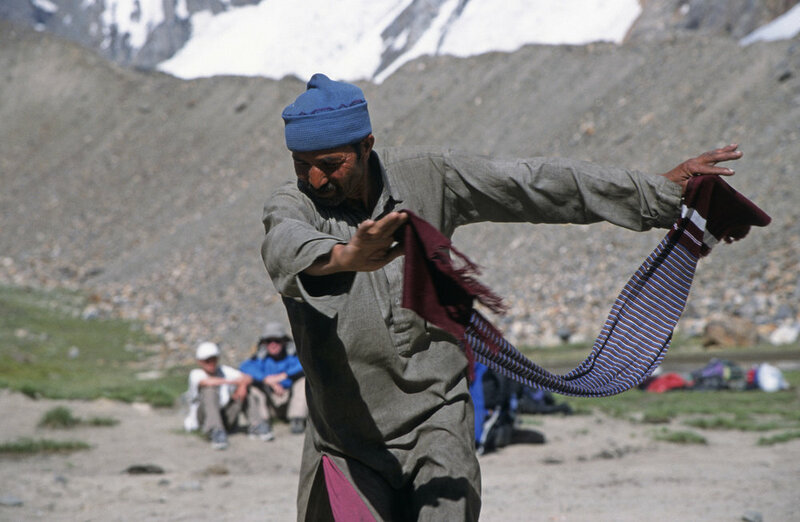 This is one of the most spectacular passes in the Karakoram. The descent from the pass was steep and rocky. There was a fixed rope put in place and we could use it to repell down. The rockfall danger was present on this section of the descent. Once off the 50 degrees section of the descent, we could relax a little. We arrived at the Ghondogoro High Camp at 4,800m in mid afternoon. We were quite tired from two days of walking the the sleepless night. View from the Ghondogoro La on the descent. Spectacular icefalls and glaciers were all around us. The view from the Ghondogoro La. The Laila Peak 6,200m is the pointy mountain half-way down the Ghondogoro Glacier. Our camp was on the green spot on the right side across from The Laila Peak. The Leila Peak from our camp on Day 12. We camped behind the moraine of the Ghondogoro Glacier at 4,800. The porters were very happy to complete the dangerous crossing and we had a sining party at dinner time. The Great Trango Tower from Urdukas. The Baltoro Glacier at Concordia. 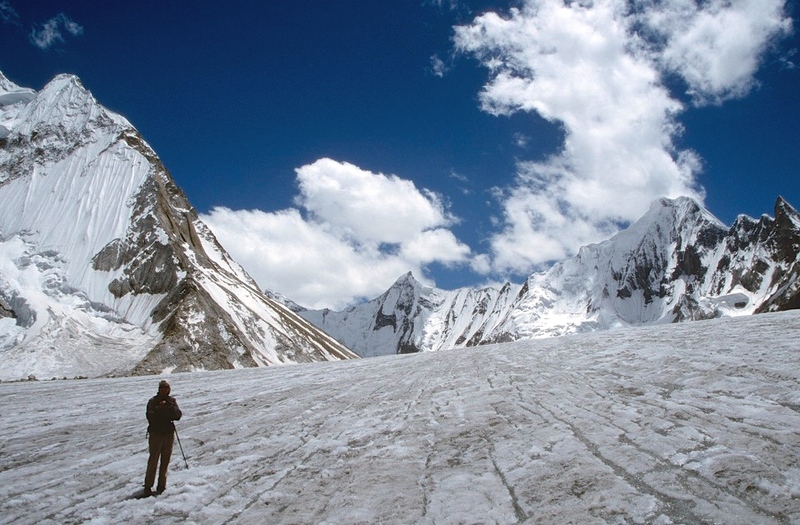 K2 and the Godwin-Austen Glacier from the Upper Baltoro Glacier en route to the Ali Camp. 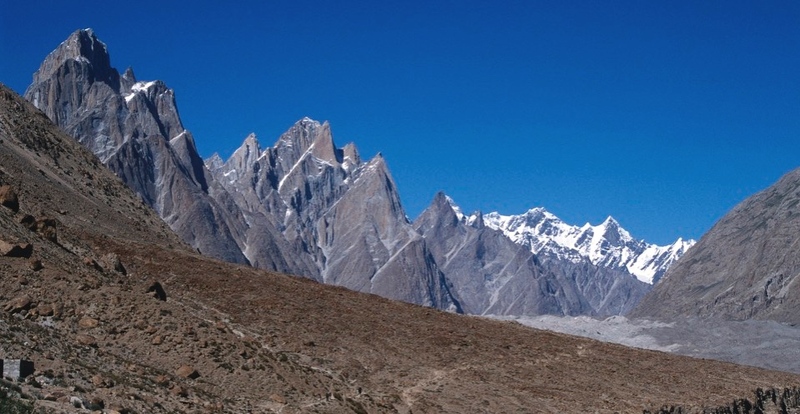 The south face of Broad Peak is on the right. The bridge over Braldu River on Day 1 of our trek. The rocky descent from the Ghondogoro La and the Ghondogoro Glacier from the South Ghondogoro High Camp at 4,800m. The pass is on the left hand side of the photo. This photo was taken on the morning of Day 13 when we walked from the Ghondogoro High Camp to Daltsampa camp at 4,300. Day 13, walking down the Ghondogoro Glacier with the Masherbrum icefall ahead. From here, we took a 90 degree left turn down the Ghondogoro Glacier. We had a very long day. We had lunch along the way when Chris (one of the guys in our party) got struck with a heat stroke. He nearly passed out and needed some rest. Then, we got delayed by rising water from the Laila Peak. As we arrived at the creek after lunch we noticed the water rising. Within 30 minutes, the creek turned into a raging torrent that required ropes to cross. We could hear boulders rolling violently in the murky and turbulent water. I lost my water bottle while trying to throw the rope to the other side of the creek. 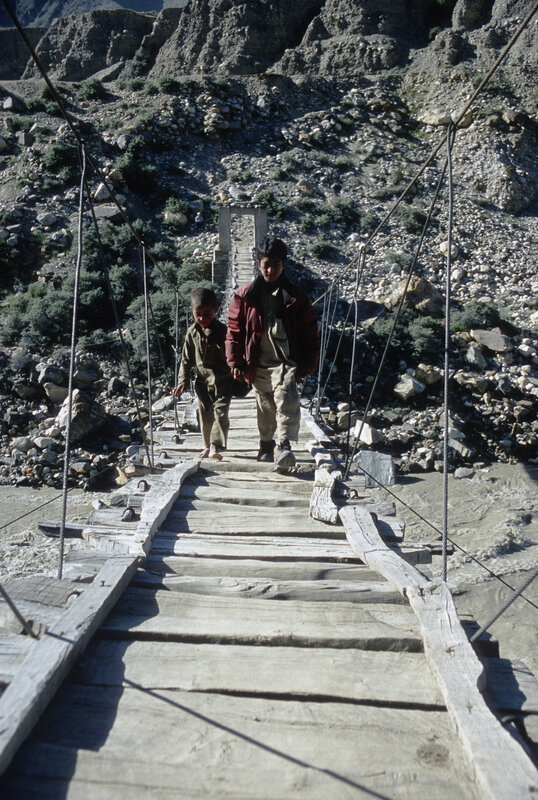 This was very harrowing crossing, especially for the porters with heir heavy loads. Finally we made it across with help from our ropes to relief of all and had a good walk down to the camp at Daltsampa. From Daltsampa, we could see the Charkusa Glacier area with the spires circling the Charkusa Glacier. Masherbrum Icefall from the trail between the Ghondogoro High Camp and Daltsampa camp. Descending towards Daltsampa camp. The dry cleft in the middle of the photo has been made by the meltwater from the Masherbrum Glacier. Looking towards Masherbrum from the trail between Ghondogoro High Camp and Daltsampa camp. On Day 14 we hiked from Daltsampa camp at 4,300m to the village of Hushe at 3,050m. It was a dry and hot walk though green fields near Hushe. We had our last view of the Masherbrum behind. On this trek we walked total distance 115km and ascended 3,450m. Machilu on the jeep ride from Hushe to Khaplu Village. Our guide Ibrahim lives in Machilu. We stopped at his house for tea on the way. Karimabad and the fort. After we finished the K2 Trek, we drove to the Hunza Valley and to Kashgar in China via the Kunjerab Pass (see the link for photos from that leg of our trip). We wanted to see the famous Kashgar market. This was another great adventure that included being involved in contraband between China and Pakistan, meeting the Chief of Police of the North West Frontier Province and visiting locals in the village of Passu.